Do you need a perfect installation of a heating device? Approach Chhaperia for choosing a heating element of your choice. 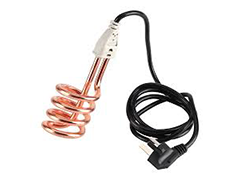 Claimed into the list of leading portable electric heater elements suppliers, we have excelled in producing sophisticated, quality-reflecting, and long-lasting electric heaters. Our successful journey for over two decades and our value delivery are the crucial factors that made us become a leading firm. At Chhaperia, each element is examined and analyzed by the expert's team thereby taking us to a world-class level. Infrared-based heating uses energy efficiently thereby reducing energy consumption. Light in weight and economical. The care in the field of electricals while manufacturing is a crucial factor. In the top list of portable electric heater elements suppliers, Chhaperia has claimed the list. The reliable execution from our team kept us to bring on A-level products.